This document will show you how to compress your file to minimize the file size while still retaining quality. The main reason you would want to flatten a document would be to decrease file size. The flexibility that you gain by keeping all of your layers separate far outweighs any decrease in file size that you gain by merging the layers together or flattening the images. 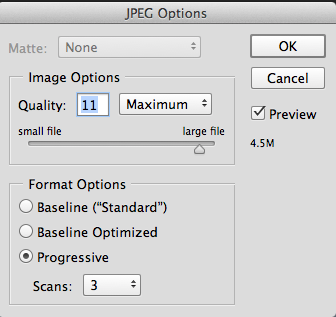 There are a few ways that we can decrease the file size. Choose file and then save as. Rename the file if you wish and choose where you want to save it. This is where other formats are as well, use the save as command to save a shareable file that suits the needs of the project. Photoshop is showing a preview, but it's previewing the image at 50%. To see this at 100%, use the Cmd key and the Plus key on Mac or the Ctrl key and the Plus key on Windows to zoom in to 100%. This will show what the file will actually look like once it’s been saved. Choose OK to save the file. A warning will appear stating that layers will not be saved in the .jpeg file format. Choose OK.
Photoshop is leaving the layered document up, so that you can still work with this layered document. It just saved off a copy of the JPEG. Be absolutely positive that these layers are at the size that they're going to remain, meaning that you are never going to want to change your mind in the future and scale them up or scale them down. Select the layer and then right click and choose rasterize layer or choose the layer menu and go to rasterize then smart object. There is no longer a smart object icon by the layer, and if the layer is made larger with the free transform tool for example, the image will lose image quality. Right now it is very easy to reposition the individual layers. After merging layers the document will lose that flexibility. Select all of the layers on the layers panel by clicking the top layer and holding the shift key and selecting the bottom one. Choose specific layers by holding the cmd key on mac ctrl key on windows while clicking to select each layer. Each layer that you click will be added to the selection if holding the cmd or ctrl key. Right click on the selection and then choose from the flyout menu to merge layers or navigate to the layers menu and choose merge layers. All of the layers are now combined onto a single layer. There is no longer any way to separate the layers once the document has been closed and reopened. Right click on any layer. If you want to maintain your level of flexibility, keep all of the layers intact and keep smart objects as smart objects.